The aim of the present team, composed of clinicians and basic scientists, is to better understand the hepatic complications of obesity, one of the most common forms of chronic liver diseases. The hepatic complications of obesity range from steatosis to steatohepatitis (Non Alcoholic SteatoHepatitis, NASH), fibrosis, cirrhosis and finally hepatocellular carcinoma. The diagnosis of steatohepatitis requires a liver biopsy. The pathophysiological mechanisms of the progression of steatosis to steatohepatitis are complex, including insulin-resistance, oxidative stress and endoplasmic reticulum stress. An imbalance between anti- and pro-inflammatory factors might be the triggering step. These factors can originate from intra- or extra-hepatic sites, particularly the adipose tissue. 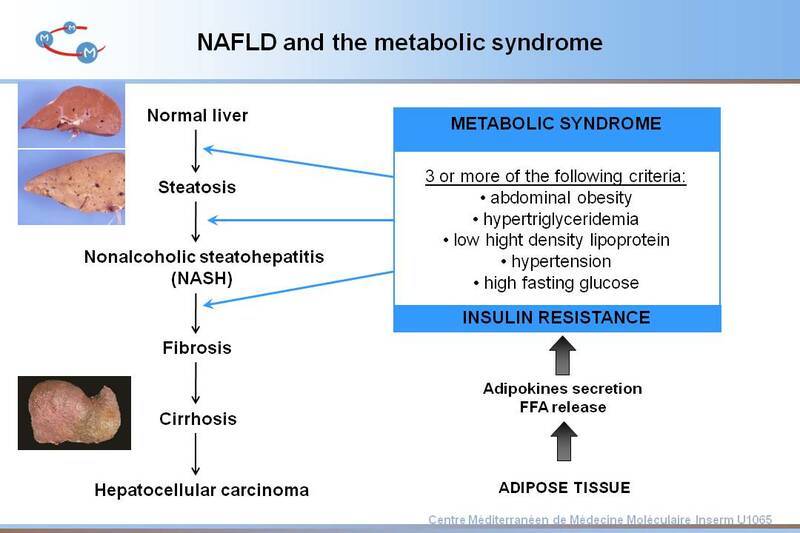 1) To develop a non invasive index from clinical data and the identified markers of inflammation, apoptosis and necrosis allowing the diagnosis of NASH in obese patients. This will be done in our cohort of 800 morbid obese patients, for whom hepatic and adipose tissue biopsies have been obtained while undergoing a therapeutic bariatric surgery. 2) To study the role of genes previously identified and new players in the progression from steatosis to NASH, fibrosis and hepatocellular carcinoma. The role of theseplayers/factors will be evaluatedin different cellular and animal models. 3) To study the development of the liver complications in achondroplasia in different cellular and animal models. 4) To evaluate and better understand the effect of pharmacological and chirurgical treatment on prevention and correction of liver complications in animal models. The results of the present project should bring new insights in the overall understanding of the mechanistic of hepatic complications induced by obesity and to propose better diagnostic and therapeutic approaches. Lavallard VJ, Gual P. Autophagy and non-alcoholic fatty liver disease. Biomed Res Int. 2014;2014:120179. Sep 10. Review. Wan J, Benkdane M, Teixeira-Clerc F, Bonnafous S, Louvet A, Lafdil F, Pecker F, Tran A, Gual P, Mallat A, Lotersztajn S, Pavoine C. M2 Kupffer cells promote M1 Kupffer cell apoptosis: A protective mechanism against alcoholic and non-alcoholic fatty liver disease. Hepatology. 2013 Jul 6. Tran A, Gual P. Non-alcoholic steatohepatitis in morbidly obese patients. Clin Res Hepatol Gastroenterol. 2013 Feb;37(1):17-29. Review.